Carl Bird of Peterborough Sports Reserves watches as his deflected free kick finds the back of the Moulton Harrox net. Photo: David Lowndes. Peterborough Sports reserve team boss Andrew Bradley has laughed off suggestions his team’s likely Peterborough League Premier Division title success has been devalued by the use of first-team stars. 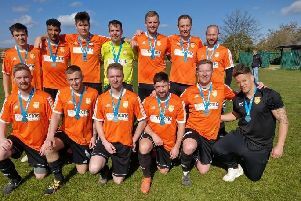 Sports have beaten all three of their closest challengers Pinchbeck, Netherton and Moulton Harrox in recent weeks, but United Counties Premier Division title winners Mark Jones, Josh Moreman, Avelino Vieira and Dan Lawlor made appearances against either Pinchbeck or Netherton. Those star men ply their trade two divisions higher than the Peterborough Premier League. Ali Nyang (red) wins this aerial duel for Peterborough Sports Reserves against Moulton Harrox. Photo: David Lowndes. “We are a club, not two separate teams,” Bradley stated. “I’d be a fool to turn down the chance to field strong players in the biggest games. We are not breaking any rules and we deserve to be where we are in the league. I just laugh at some of the criticisms I have seen. Sports still beat Moulton 1-0 (April 22) thanks to an early Carl Bird goal and a 6-0 win at AFC Stanground Sports on Wednesday (April 26) helped maintain a four-point lead at the top with five matches to go. They will all be crammed into a 14-day spell which starts at home to Deeping Rangers tomorrow (April 29), but second-placed Pinchbeck must play their final five games in 10 days! Pinchbeck host Leverington tomorrow. Action from Peterborough Sports Reserves against Moulton Harrox. Photo: David Lowndes. Peterborough Sports Reserves: April 29 v Deeping Rangers Reserves (home), May 2 v Holbeach United Reserves (away), May 6 v Stamford Lions (home), May 9 v ICA Sports (home), May 13 v Wisbech Town Reserves (away). Pinchbeck United: April 29 v Leverington (home), May 2 v Stamford Lions (away), May 4 v Ketton (away), May 6 v Sawtry (home), May 9 v Langtoft (home). There’s a Peterborough League cup final at Peterborough Northern Star FC tonight when Division Two rivals AFC Stanground Sports Reserves and Farcet meet in the Intermediate Shield (7.15pm). AFC Stanground Sports Reserves v Farcet United (7.15pm). Premier Division: Moulton Harrox v Ketton, Crowland Town v Stamford Lions, Langtoft United v ICA Sports, Netherton United v Uppingham Town, Peterborough Sports Res v Deeping Rangers Res, Pinchbeck United v Leverington Sports, Wisbech Town Res v AFC Stanground Sports.